I wasn’t going to do a review tonight but since I’ve been curious about the M&S ‘Dine In for £10’ beer option for a while I thought I’d say a little bit about it. Normally, when I get the ‘Dine In’ I go for the wine since it’s normally fairly decent and comes in handy if I go to a friend’s house and want a bottle to take. Recently, however, they have started to offer a beer and, like most fashionable supermarkets these days, they have teamed up with a popular brewery. 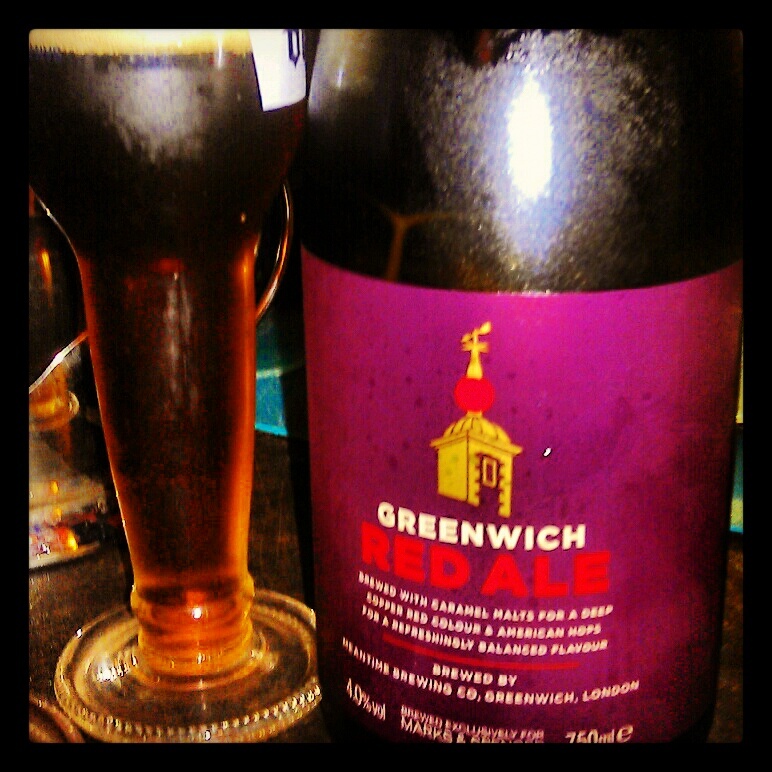 Greenwich Red Ale (4%ABV) is a collaboration with Meantime so I was quite keen to try it since they normally do a decent ale. It’s presented in a beautiful corked 750cl bottle but the cork did end up being fairly troublesome though since it seemed slightly too small and the OH ended up using molgrips to remove it! So, was the battle with the cork worth it? Sadly not. Looks-wise, it’s a beautiful deep amber with a fluffy white top but the smell is not really that pleasant. There’s a little fruit but it reminds me too much of old washing-up sponge. The flavor is bitter up front but not in a hoppy way, even though it was made with five different hops from the Yakima Valley, Washington. The bitterness gives way to berries, but it’s all hollow and there’s nothing but dryness at the end. From M&S and Greenwich I would have expected more. I would advise go with the wine next time.